ABC-TV’s science program Catalyst and one of its chief science reporters Dr Maryanne Demasi have been nominated for the Australian Skeptics’ Bent Spoon award. A report by Dr Marianne Demasi, titled “Wi-Fried” and broadcast on February 16, looked at the supposed health dangers of wi-fi connections for smart phones, laptops, tablets, etc. The program and Dr Demasi have been criticised before for promoting unsubstantiated scientific ‘evidence’ of ‘dangerous’ products. In 2014, Dr Demasi and Catalyst presented a case against statins in cholesterol control. The program was criticised for using ‘experts’ with vested interests in promoting alternative medicine to put the anti-statin case, and pitching the proponents of established evidence-based medicine into a minor role. This time the same process had been used to alert people to the dangers of sticking smart phones to their ears – it used six ‘experts’ (at least one without any attribution) to put the case for the supposed dangers, and only one scientist who pointed out the lack of any scientific evidence that supports the danger claims. Even that scientist was encouraged to state that science was never 100 per cent sure of something, which in the program’s point of view equated to “you can’t therefore say it’s 100 per cent safe and therefore it must be dangerous”. In response to the criticism, Catalyst responded on its Facebook page that “The program and its producers recognise there’s a debate, understand that the science is not settled and that it is an issue of public concern. That’s why the Catalyst program spoke to those who consider the increased risk to be significant and concerning, and to others who do not consider it to be significant, including extensive quotes from a spokesman for ARPANSA and the industry body AMTA. The program also included the views of prominent brain surgeon Charlie Teo and prominent cancer expert Professor Bruce Armstrong (IARC 2011 committee). Perhaps because of the claim that “the science is not settled”, the Catalyst story allowed many unsubstantiated statements that ignored scientific evidence to be made, and some of those statements were wrong. Dr Sarah Loughlin of the University of Wollongong, a researcher at the NHRMC’s Centre for Research Excellence in Electromagnetic Energy, as well as a member of the WHO Environmental Health Criterion Evaluation Committee on Radiofrequency Fields, said that “Many claims were made without providing any substantiated science to support what was essentially individual and selective opinions that were used to paint an incorrect picture of the current state of knowledge. “Indeed there is currently no scientific evidence that exposure to low level radiofrequency, such as emitted by mobile phones and wi-fi, has an impact on health. Dr Devra Davis, an American epidemiologist and writer who was featured prominently in the program, countered the lack of scientific evidence for brain damage from wi-fi radiation by saying that it was too early to see any rise in brain cancer caused by mobile phones or wi-fi, and argued that brain cancers after the Japanese atomic bombs did not appear for 40 years. “This is simply incorrect,” said Dr Simon Chapman, Emeritus Professor in Public Health at the University of Sydney. He cited a study published by the American Cancer Society that reported on central nervous system cancers (including brain cancers) in those exposed to atomic bomb radiation in Japan, which found that more than 58 per cent of those studied were diagnosed in the first 40 years, and some much earlier. For a supposed scientific program, one sequence in particular was indicative of poor scientific support for the radiation claims. Dr Davis used illustrations to explain the supposed extent of radiation damage to the brain, but these were obviously photo library shots of a man and a little girl with colours superimposed on them. 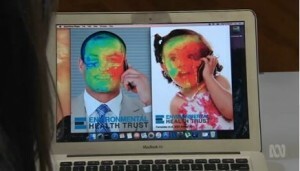 The program said this showed thermal imagery of radiation seeping into the brain, but this imagery could have easily been applied to any object – it was not generated by those particular subjects. Nonetheless, Dr Demasi seemed impressed by the colours. Next Chiro v GP – who’s more qualified? Is it wrong to be amused by the number of people flooding to their computers to complain about the dangers of EMR? If there’s truly an epidemic in the world at the moment, as our anti-science, anti-medicine brothers and sisters insist there is, then it’s not cancer, autism or ADHD, it’s cognitive dissonance. Tim’s article well describes the evidence, and I would like to add some theory. I have worked with electromagnetic radiation for 40 years, and know that all its effects are accounted for. There are no gaps in physics whereby non-ionizing radiation (including wifi) can cause chemical change in tissue. The most you can get is slight heating – less than standing in the sun. Observation and theory agree – Cancer is out.